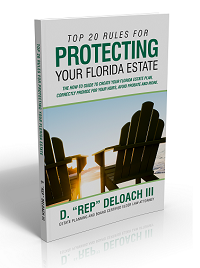 Creating A Will In Your Florida Estate Plan | DeLoach, Hofstra & Cavonis, P.A. Creating a Florida will is quite easy and very affordable here at DeLoach, Hofstra & Cavonis, P.A. Once done, you will have peace of mind knowing that your children will be raised by the person you choose and in the way you choose if the unexpected does happen. A legal Florida will is a very simple way to make sure that you can continue to care for your family even after you are gone. A last will and testament is a simple and affordable way to make sure your probate assets are distributed to the correct place upon your death. So, why is it that so many people choose to do nothing when it comes to planning for their own demise? Possibly it is because no one likes to think of a day where they are no longer able to be there for their family. But it is important to know that, just like paying taxes, death is unavoidable. As part of our estate planning process, we will discuss creating either a “will based” or a “trust based” estate plan. In our free, initial consultation we will review your goals, review how probate will affect your goals and make sure you have made the right choice for yourself and your heirs. Creating a last will and testament is easy and affordable here at DeLoach, Hofstra & Cavonis, P.A. Once done, you will have peace of mind knowing that your wishes would be accomplished and your heirs protected the way you choose if the unexpected does happen. What Makes a “Good” Last Will and Testament? A good Last Will and Testament is comprehensive, clearly-written, easy to administer, and has the capability to stand up in court and fulfill the wishes of the deceased. Poorly written, never-updated wills can leave behind headaches that can take years (and a lot of money) to unsnarl. Wills crafted by concerned, yet untrained, friends, attorneys or websites can often rob a family of its rightful inheritance—legally. Who hasn’t heard the stories where people have forgotten to alter their wills to reflect changing family relationships and situations? The rules governing Last Wills and Testaments are hundreds of years old. The creation of a valid and enforceable Last Will and Testament is not as easy as many people believe. 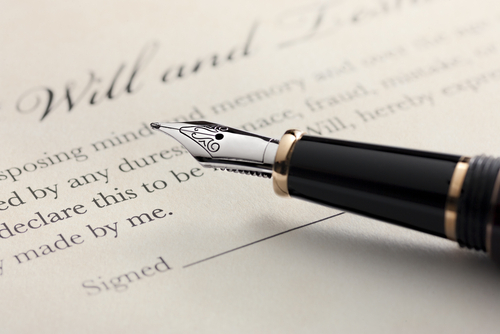 If you expect your Last Will and Testament to do what you want it to do, you definitely need an attorney to help you. Our offices have seen the terrible results of people creating or changing Last Will and Testament documents without the assistance of a good attorney. Probate courts will not “guess” what you meant to write—they will read and interpret what is written according to the law . . . no matter the results. What Other Documents Should I Have Besides a Last Will and Testament? Besides a last will and testament, everyone should have a durable power of attorney, designation of healthcare surrogate and a living will. If you want to know more about all 4 of these essential documents, please see our handout Estate Planning Documents for Everyone. Want to Learn More about Wills, Trusts and Probate? Finding good answers to your questions is not always easy. We have included a section on Frequently Asked Questions, our Blog posts and Videos that may be helpful to you and your family. Give us a call and we'll set up an appointment for you to talk to us. We'll help you find the most effective and most affordable estate planning options so that our work matches your goals. A will in Florida is much more than a piece of paper. It is the document that will lay the foundation for your family if the unexpected happens to you. We will be glad to sit down together to discuss and create your last will and testament, how your wishes can be accomplished and how your family can be protected. A cheap last will and testament may seem like a really good deal on the surface - for a little bit of money you can go online and have your will prepared without an attorney. But a will can be a complicated matter – estate attorneys go to school for years and then received specialized training in order to create a flexible and accurate will. Think of it this way – do you want your final writing to your family to be an accurate reflection of your goals? Do you want fewer problems for your family? When you create a will you need advice and counsel from a qualified estate planning attorney to make sure that it will lay the foundation that you intend. Just Moved to Florida? We can Help! If you have recently relocated to Florida, you will need to have your estate planning documents reviewed by an attorney. It is a little known fact that your existing estate planning documents, including your last will and testament, may not need to be changed, but it is always best to meet with an attorney to confirm that your current wishes are accurate and that all of your documents conform to Florida law. Also, see our FAQ on having just moved to Florida. Life changes happen to everyone. There are babies born, marriages and divorces, and other family circumstances that may cause you to change your mind about your will. If you have a will and it has been more than a few years since you reviewed it, you should consider all the changes in your life and in your family and then take it to a qualified Florida will and trust lawyer to update it. One of our goals is to make sure you understand your choices and make things as easy for you as possible. We are here to give you good advice based upon your wishes, assets and family. Clients frequently comment that we made things much easier for them than they would expect and we are proud of that. Whether you don't have a will or trust, or you have one that needs to be updated, give us a call and we'll meet with you free of charge to make sure that your estate plan is in order.